In the pool there is a Dennerle NanoCube. As I was struggling because of sunlight with blue-green algae / cyanobacteria and pelvis did not want to change locally, I have redecorated it in February 2015th Here I also have the side windows with black foil glued to minimize the incidence of light. The right side shows a south window, here the film was necessary. The film on the left side I have attached only because of the optics. Daylight and some morning sun, there are now only from the front / angle from above. 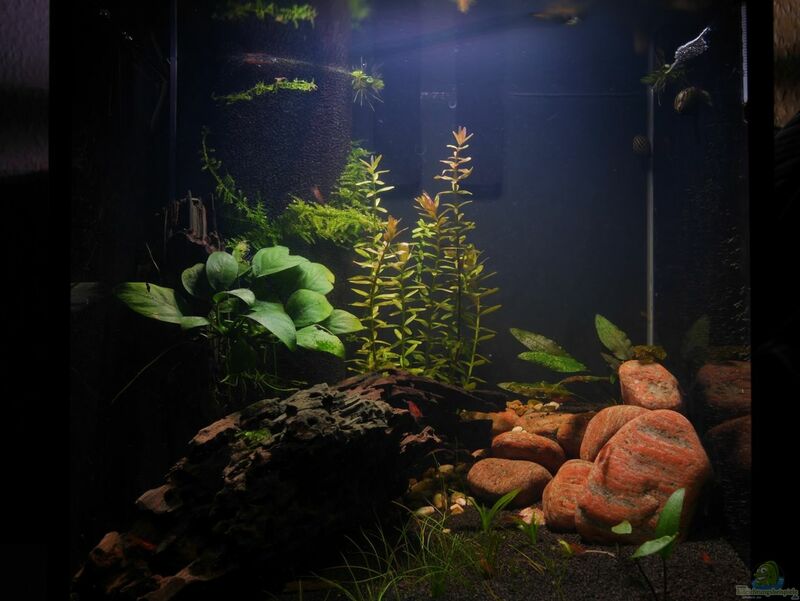 Bottom layer aquarium gravel 6-8 mm mixed with Dennerle Nano DeponitMix, on 2 kg Garnelenkies. The pebble I have introduced in order to back "terassieren" the gravel something. Under the ground is a Bodenfluter ("floor heating") of Dennerle. 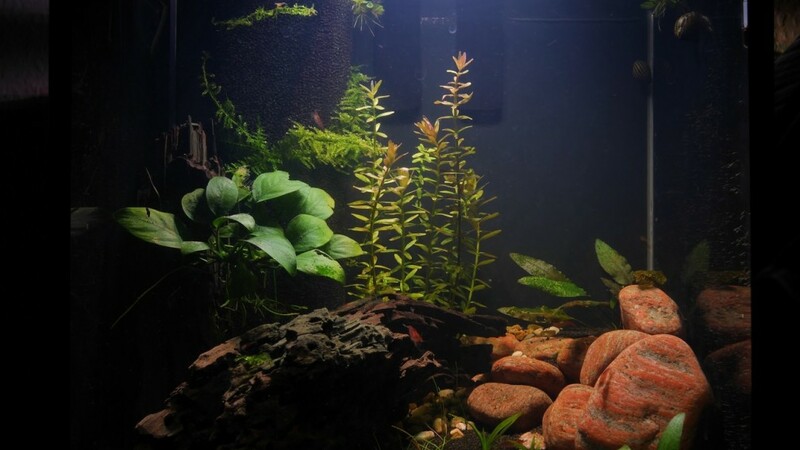 All plants I have taken from a second aquarium (280 l). Since I have these acquired a long time ago, I'm not quite sure what specific ways I have. Here an attempt. Overcorrections I am grateful! 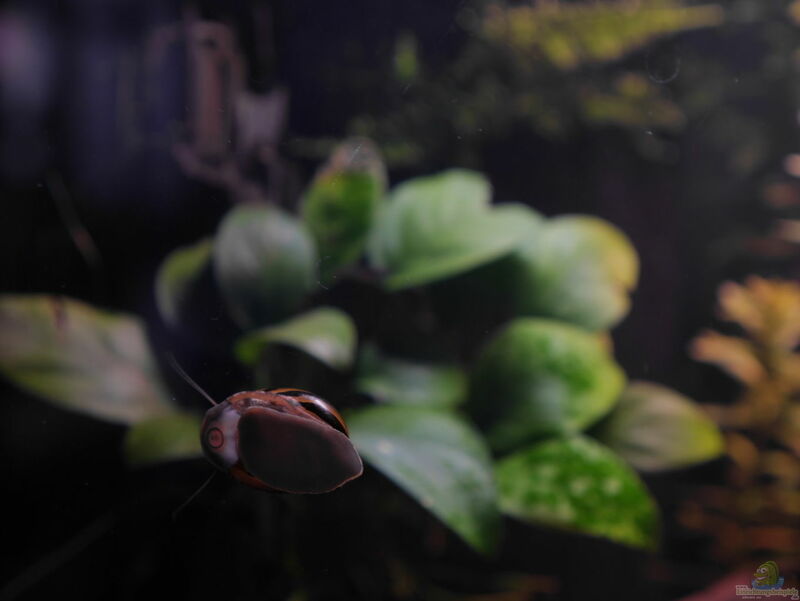 Anubias (nana?) - Left, grown on a piece of wood. Rotala rotundifolia - The stem plant rear right. Depending on the location, light and nutrients, the leaves go to Reddish. Grows fairly decent and must be pruned regularly. 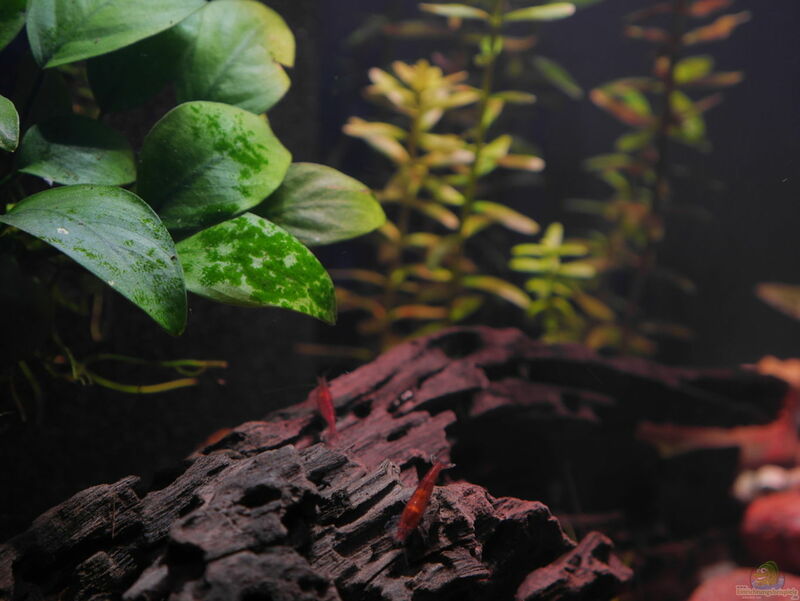 Cryptocoryne beckettii (??) - on the "terrace" rear left. The plant has already formed an offshoot peeping as a tender green shoot from the ground. In addition, another 2 so far quite small Cryptocoryne Left Front. The were quite micktig in large basins. Let's see how they evolve here. Christmas Moss (Vesicularia montagnei) - the filter. Sagittaria subulata (? ), 2 mini plants in the middle. Planted as a young offshoot of a very large mother plant from the large pool. Fertilization takes place weekly with "Easy" products in 280 liter aquarium, after which the exchange water is taken there. 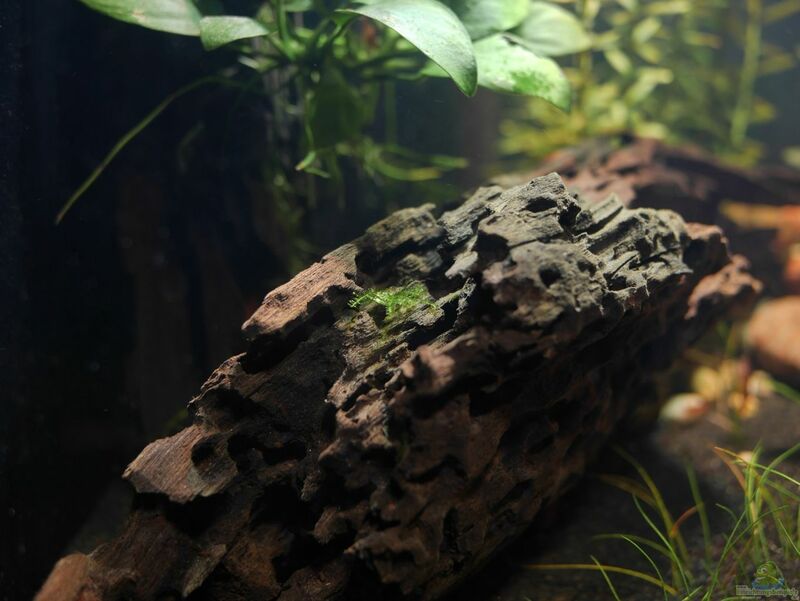 2 wood roots, one ajar standing in the left corner on the filter, with Anubias. Another previously lying. Both are beautiful and full of holes provide the shrimps many hiding places. They will gladly grazed both of the shrimp as well as the racing snail. To form reddish stones, a terrace and a contrast to the dark floor and background. I'm still not agree me think that's great in one day, the next very cheesy. Possibly are still planted and thus hiding something more. Hamburger mat / Eckfilter Blueline hunting, operated with a Aquel Fan mini internal filter as a pump. This can be regulated and quite far runtergeregelt to achieve an optimal flow rate (calculation tool here: http://www.oliver-baltz.de/HMF_Berechnung1.html). The water outlet of the filter is directed through a tube to the diagonally opposite side of the aquarium. 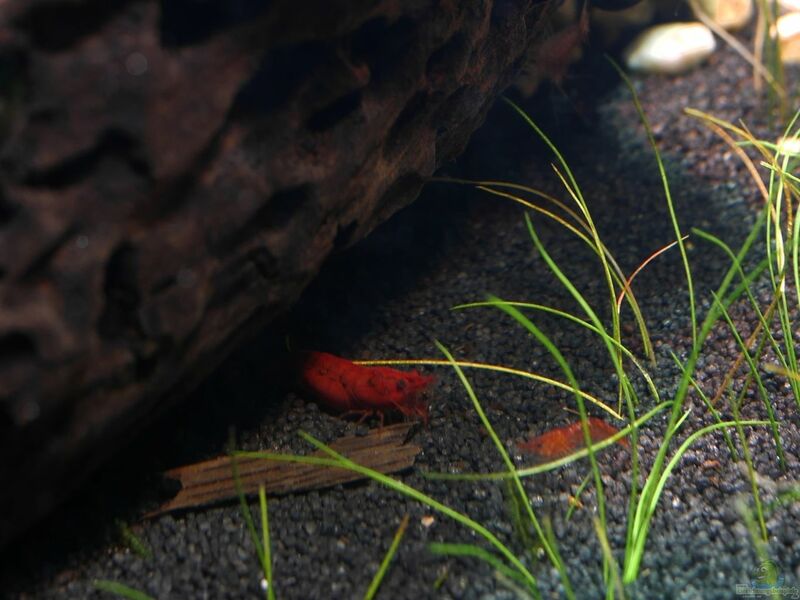 Red Fire Shrimp (Neocaridina heteropoda var. Red), about 30 animals, acquired in late February 2015, an ornamental fish exchange. The seller has been kind and the requested 20 animals rounded up neatly, including juveniles and females with eggs. Meanwhile, I've spotted the first babies. With strong proliferation excess animals are placed in the large aquarium. Are still out of the large pool 3 leftover Red Fire "Sakura" shrimp with particularly intense red staining and significantly larger specimens added than the "normal" Red Fire shrimp. 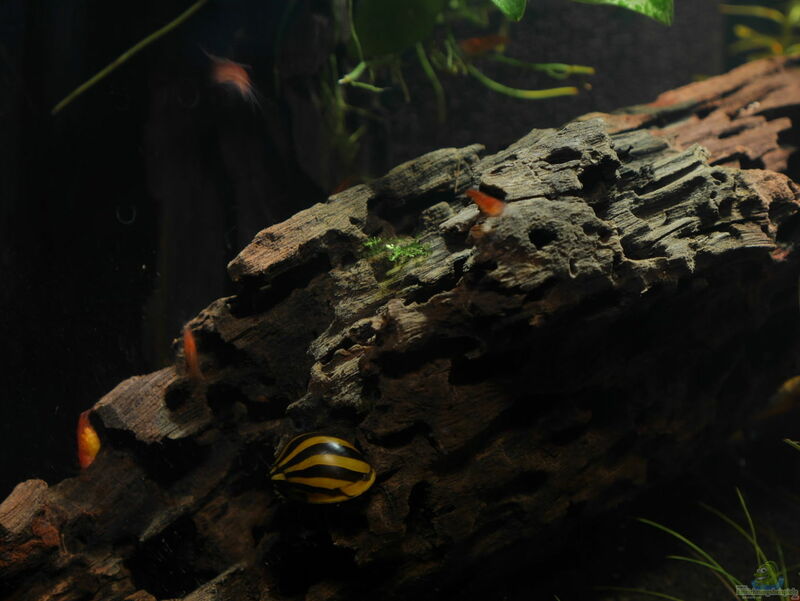 Zebra racing snails (Vittina coromandeliana) - 5 animals, as long as there are visible enough regrowth, the animals remain in the pool, otherwise a partially "offset"
At times: Zebrafish (young fish to at most 2 cm), currently no. 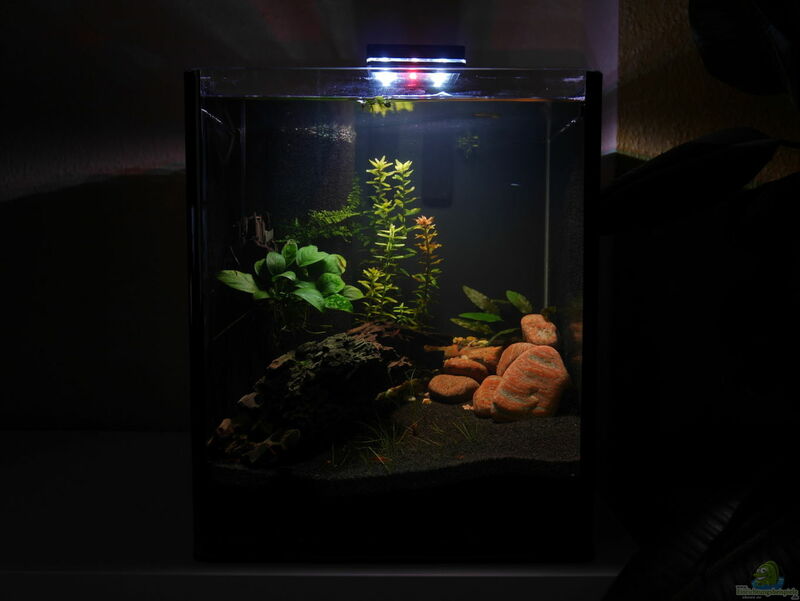 All values ​​are approximate values ​​and are measured in large aquarium, from which the water comes in a nano aquarium. When changing the water about 5 liters of water are removed from the large aquarium after there the water change was made, and fertilization is done so. Water change usually weekly 5 liters. TetraWafer Mix - Staple food mix for all bottom fish and crabs. Gibts 2-3 times a "tablet" when juveniles are weekly there often. Shrimps battle it drum. By flow ever drive a few fine crumbs through the pool and be destroyed by the juveniles. Cucumber: From time to time a disc is removed again after some time. The shrimp nibble like it. small Seemandelbaumblätter when a sheet is gone, comes in a new one. The food selection is the future, and partly. Depending on the season expanded (so rare to the first nettles happy).